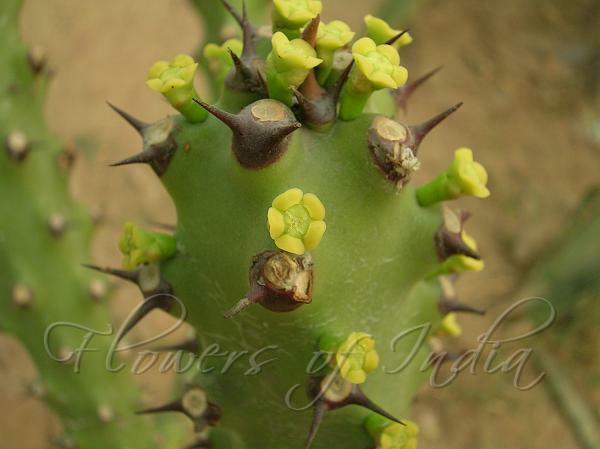 Indian Spurge Tree is a prickly, large, branched, erect, succulent leafless shrub that occurs in dry, rocky and hilly areas of North, Central and South India. 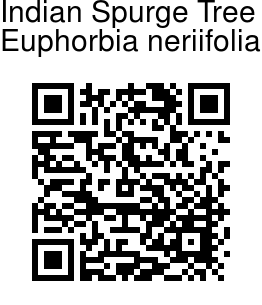 It is a tree or shrub, 3-5 m tall, hairless except for cyathia. Stems are 6-15 cm thick, green, with 5 spiral ranks of tubercles, ascending, branching from upper parts. Leaves are alternate, apically clustered, persistent, fleshy; spine shields small, stipules pricklelike, 2-3 mm; leaf-stalk short, 2-4 mm; leaf blade obovate or obovate-oblong to spoon-shaped, 4.5-12 x 1.3-3.8 cm, fleshy, base narrowed, margin entire, tip blunt, apiculate; veins inprominent. Cyathia in subat branch-ends cymes, flower-cluster-stalk about 3 mm; cyathophylls membranous, falling off; involucre bell-shaped, about 4 x 5-6 mm, lobes 5, rounded; glands 5, fleshy, thick and entire. Male flowers many, bracts linear. Female flowers rarely developed. Indian Spurge Tree is found in Peninsular India. Medicinal uses: The latex or milky juice is used for treating ear pain, skin diseases, warts, scabies etc. One of the very extensive medicinal use of this plant is for pain in ear and inflammation of the ear, for which juice extracted from the heated leaves is used as ear drop. Identification credit: Nandan Kalbag Photographed in Garden of Five Senses, Delhi & Kumbharli Ghat, Maharashtra.